Congratulations, you have just arrived in Skyloft. This cozy island in the sky will be your worry-free home for the rest of your life. Under the watchful eye of The Goddess, citizens fly around on giant birds, sell items at the bazaar and run ordinary lives. Then BLAM, the game begins. The Legend of Zelda Skyward Sword is Nintendo's latest Zelda game, celebrating the franchise's 25th anniversary. 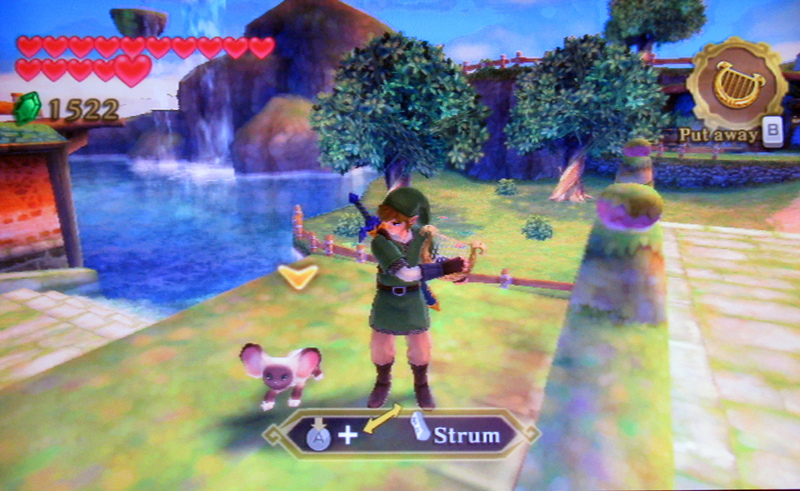 The game is also the first full Zelda adventure designed around the Wii's capabilities, rather than the Twilight Princess port from the GameCube era, and ignoring the mini-game collection that was Link's Crossbow Training. I played through the game is approximately 32 hours. After completion of the main game, a Hero Mode becomes accessible offering a more difficult but largely unchanged experience from the vanilla game. Since the Nintendo Channel give about a 38 hour completion aggregate, I imagine that few people played through the Hero mode. Since the game is not uber-difficult to begin with, I'd suggest newcomers grab a save file with the Hero mode unlocked and start from there if they want a challenging experience. Proceed with caution, this review sounds very negative and has some spoilers. Nevertheless, don't let that deter reading more. I constantly battled Skyward Sword to my favorite game in the series, Majora's Mask, in my mind when I wrote this, finding aspects where Skyward Sword has lost the fight with its past. With that disclaimer, if you enjoyed previous 3D Zelda games in the franchise you will probably enjoy this one too. The biggest item on everybody's mind for this newest Zelda appears to be the controls. 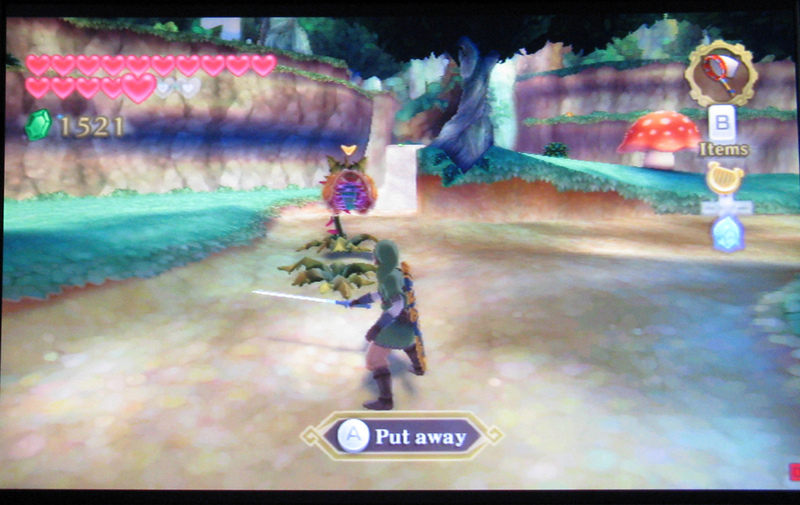 This is the first Zelda game to utilize the Wii-motion Plus accessory, with the expectation of nearly 1:1 sword play, and increased strategy in combat. Put your concerns to bed, the controls work wonderfully. Calibration is done once at the beginning of the game and that's it. In segments of 7-hour play, I never had to re-calibrate the Wii-mote. When using items such as the slingshot, the game automatically centers the cursor depending on where you were pointing when activating the item. This can be a pain for players that don't understand this feature, but for those who do, it eliminates having to press down on the D-pad to re-center the Wii-mote manually and enhances reaction time. How do the controls work? Slice upward to have Link slice upward. Slide from left to right to have Link cut his sword in the same pattern. Other controls work similarly, with stabbing being the most unique with a forward jab. Shake the nunchuck to block with the shield. These controls are important because the entirety of the game and some puzzles are based around this directional-based swordplay. Enemies block from certain angles, and others require feigning a rightward horizontal slice only to make it a quick leftward one. Once I had grown familiar with the controls over the first few dungeons, never did I have issues with the controls being unresponsive. Instead, I found mistakes in attacking were my own. Players cannot spam slicing attacks with the intent to win. This works on simple enemies that were meant to be fodder, but when facing bosses and stalfos you better not. Being blocked too many times, from attacking at the improper moment or not waiting for an opening, has the enemy respond with a powerful nearly un-dodgeable attack as punishment. Combat may feel slower for those used to the earlier games but is styled with the finesse of proper timing and balance. By the end of the game I could easily resolve battles with enemies that had initially gave me some trouble just by my greater handling of my blade and shield. This is a great feeling because it almost usurped the need for upgrading equipment. Rather than having to earn xp or upgrade my sword with new powers to offset increased enemy strength, I fought with enhanced prowess from actually learning. 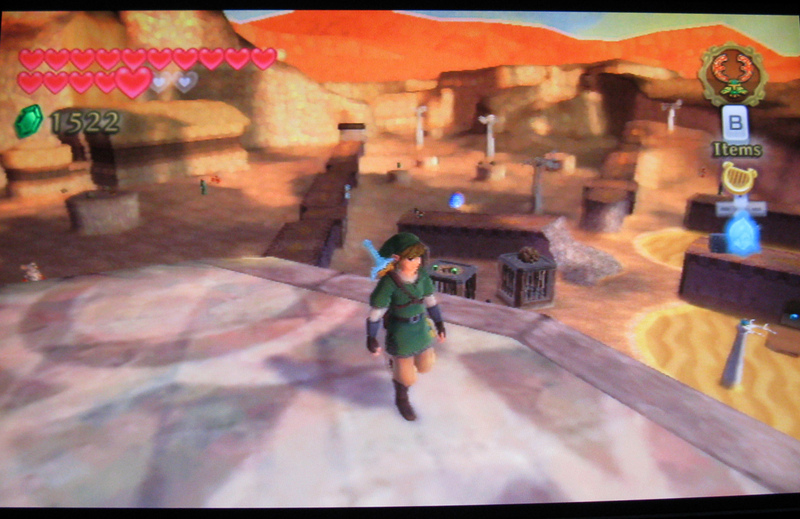 Throughout his quest, Link will find himself leaving Skyloft to explore strange new lands. And he will explore these lands many many times. There are only three main worlds, of which each will need to be visited a minimum of three times before the end of the game. Between these worlds is the main overworld, a largely barren space where a lot of downtime will be spent soaring about the clouds. As the game piled on the fetch-quests, the distance between destinations felt lengthier on each voyage, and I wished for a fast-travel option. 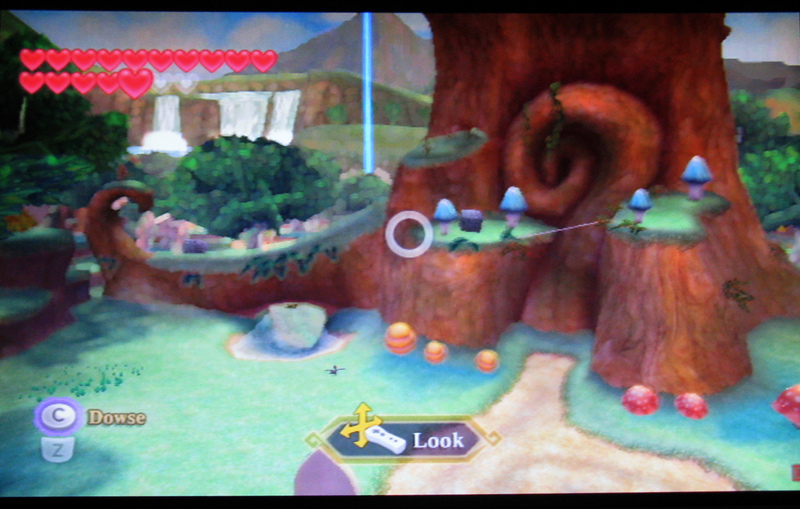 The game's worlds are well designed though, permitting exploration by different means once new quest items are within Link's arsenal. Furthermore, as new sections of the main worlds are unlocked, these new sections focus on fresh gameplay experience. The forest stage was initially a walkable stage, but what if it had water? Here's that familiar molten magma-landscape, now stealth past those enemies. Nintendo applies a wide range of gameplay mechanics features from its past games as well as some new ones to try to keep the action fresh. Yet, repetition was the deadly hand that Skyward Sword played much too often. After completing a main quest collection quest, I figured the story was progressing. Little did I know (Or maybe I should have guessed it) that I would be forced to return to all three worlds to collect another set of items, and then another. There was also a feeling of "filler" to the 32-hour adventure as one boss is fought three different times. Granted, he acts differently each time but the basic mechanisms to his defeat are the same. The series' staple of dungeon crawling is less distinct from other games with the main worlds holding the bulk of the challenges. While it might take 4 hours to gain access to the dungeon, the dungeons were much shorter, with only an hour to an hour and a half of solid play. These dungeons however were equally if not better designed than the main worlds, with highlights including rolling on a lava ball and rearranging the entire dungeon's shape. Dungeon design also made full use of Link's equipment, not relying solely on the newest item earned for every puzzle's solution. The bosses however were pitiful, and who's sometimes 4-minute defeat made even the dungeon seem lengthy in comparison. Catering to an Internet-age that can easily look up info on an FAQ, Skyward Sword does not attempt to hide tips and tricks. A gossip stone in Skyloft will gladly give hints away free on how to defeat the game bosses and how to reach platforms thought impossible. The new addition of dosing also makes finding items as easy as surveying the landscape and listening for the loudening of the ping. Neither element is required to beat the game, but will prevent aimless wandering/exploring on a probably already highly explored terrain. I relied heavily on the dousing to save time but tried to limit my accessing of the gossip lest I ruin the game play. As a warning to that, I was having trouble beating the final boss and so watched the hint video that revealed a tactic that completely slaughtered him. Skyward sword has a crafting system and like most crafting systems it requires some manner of material to forge the new item, upgrade or thing-a-ma-bob. From tumbleweeds to the skulls of his enemies found through the land, Link savages anything that crosses his blade. Some of the collectables are kind of neat, in that to get a blue feather, Link may have to be crafty at catching a blue bird frolicking about. The vast majority however are found averagely on the ground. Collecting these things were a drag. Upgrading equipment was largely unnecessary and when I wanted too, I was always missing one component. Despite some items supposedly being rare, I would have a bunch of them, while missing the required common items. Given my fatigue of backtracking to the worlds, I hardly ever wanted to search for ANY components, and went on my quest without them. Nothing was more disappointing in the game than when I completed a difficult challenge or mini-game, and rather than be rewarded with Rupees or a heart container, I was given a "rare" crafting item, which I knew I would never use for anything. The second tier of collectables came from bug collecting. I felt that this replaced the fishing from some of the past 3D Zelda adventures as the behavior of the bugs were modeled very deeply. Quietly sneak close for that capturing strike with the bug net or rush madly at insects as they hop, crawl or bug away, the choice is yours. Though be warned that that running at bugs may lead to unintentional/intentional bug smashing. Watch your step. (And it happens with a cute Pikmin-y ghost too :D) Bugs can also be stunned out of trees with a roll and knocked off nearby walls the same. Sadly, bug collecting only allows for using the bugs in potions or selling them. I was hoping for more to do with this feature as collecting the bugs is more interactive than just finding a collectable ore. Above all quarrels with collectables, the worse feature was the unwavering reminders of what the items were. The first time a collectable was obtained a bio would be given about what it was. 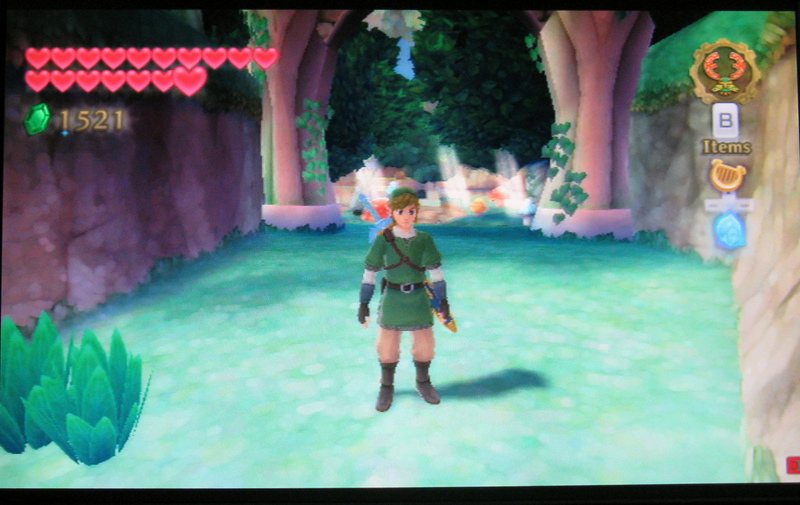 The second time a collectable would be obtained Link just picks it up as easily as a heart container. BUT, each time the game is reset; all these bios are also reset. Nintendo must have thought, "The player turned off his console for 10 minutes, we better remind him of what all the collectables are in case he forgot." I actually had an aversion to picking up collectables to avoid this "HEY!" moment, not knowing if I picked one up earlier in the play-session or not. This is another reason I played the last 15 hours of the game on 7-hour stints. Thank goodness Nintendo had the decency not to do the same with every rupee and heart the player picks up. "Link, you just picked up a heart. This fills your life bar by one heart." "Link, you just picked up a rupee. You might be able to purchase goods and services if you collect enough." My favorite parts of Zelda games have been ignoring the main quest and just playing around with the world. Majora's Mask got this right for me. The player could obtain many masks that while proposing specific purposes could also be worn just for fun. From there, one could mingle with characters, see how they react, or just roleplay. While the denizens of Skyloft are a cheerful bunch, they lack equivalent characterization. In Majora's Mask, by following a character around all day, the player could understand their temperament as they went about their jobs. In Skyward Sword, the characters are static. While the game has a day-night cycle, it must be player activated and the nighttime is more restrictive than explorative, with only a couple zones being accessible. Performing quests for the citizens yields special oozy crystals that can be exchanged for rare items like rupee holding wallets, so I definitely wanted to complete them. But, many are once again "Go find X" type missions. After their corresponding mission was done, most characters never changed their dialogue again giving little reason to revisit them. Since Skyloft is the main hub of the entire game, I was hoping for more randomness here as well. I do love the jolly shopkeeper, and the glowing eyes of the fortune-teller, which is why I craved more of their wayward interaction. Text is cheap to implement, and Skyward Sword doesn't even have voice acting. As far as other things to do, once the game is over I have surprisingly little urge to continue playing. The backtracking annoyances and collectable annoyances killed most of the desire to explore. The characters become broken records, and that leaves only mini-games to tide one over. Ignoring the reward of the collectables, the mini-games are just average. Many are too shallow, such as Fun Fun Island, and upon reaching the maximum score presented little chance of improvement or desire to try. Others such as the chopping the bamboo are limited by technology. The best mini-game was the pumpkin archery that represents both the beginning and end of the history of Wii-remote games. Overall, the world needs more stuff, but not stuff worth caring about, stuff for random play. The game takes on a watercolor style, complimented by very bright texturing. Far off distances are faded away with a blurring filter. Up close, the characters are detailed with some surprisingly expressive animations for a Zelda game. Overall, the graphics fit and besides the trees being noticeably made up of layered flat textures, they are stylistically and visually good. Good, but good enough? I rather wished the graphics had pushed the game a bit farther. I can tell the game has a very wide draw distance, being able to stand on the top of a tower in the desert and see surrounding areas, but it isn't until a part of the game arrives with upward of 40 enemies on screen do I comment, "Now this is what the Wii is capable of!" I wished I had that feeling all the time. Skyward Sword's music plays homage to other musical numbers in the series, having the same house song as Ocarina of Time, and Zelda's Lullaby from A Link to the Past. For those who are unaware at this point, Zelda's lullaby is the Skyward Sword theme in reverse. This new theme is fantastic, and I enjoyed its overarching melody through the game. Some character's themes also have this overlaid treatment, with Groose's theme appearing in several renditions and paces. 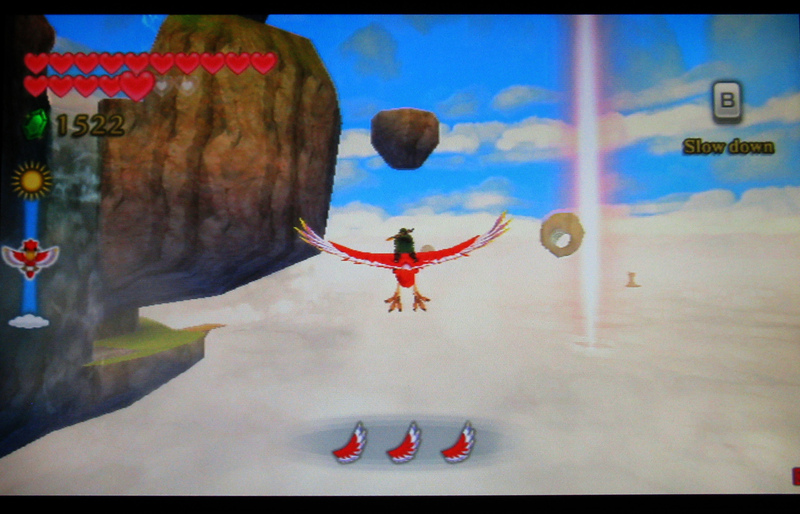 As a whole though, when Skyward Sword's music is not borrowing from its parents, it falls back to normalcy. Most tunes were emotion-drawing pieces but lack memorability outside the game world. The two exceptions were the themes I mentioned earlier, which I scoured YouTube for renditions. 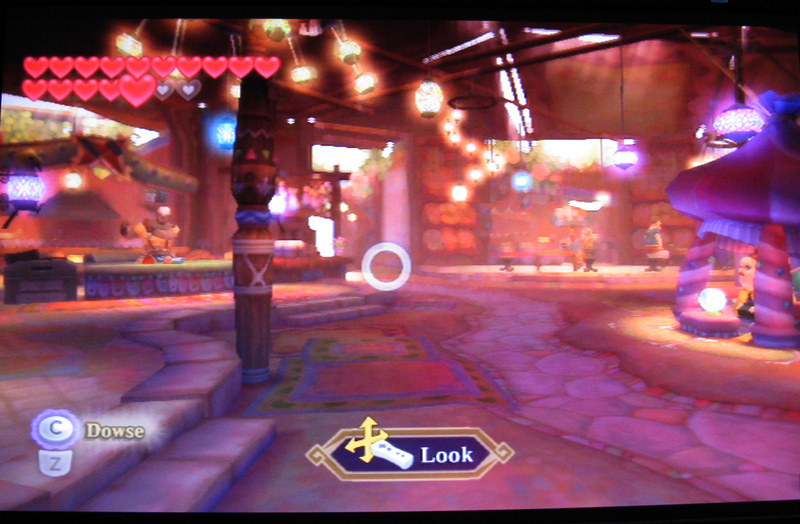 Besides that, the game's bazaar has a great fading effect reminiscent of N64 midis of old, despite Skyward Sword using streaming audio. As Link moves about the bazaar, the songs pacing and instruments shift with the grungy repair shop smoothly transitioning into the flowery item check but keeping the overall structure of the song intact. Many of the songs are noticeably synthesized giving the music a very clean air with every synthesized tinkle audible and keeping with its roots. Link can jazz along with these tunes when he finds the Harp, matching their tempo. Another neat musical touch. Finally, sound effects for this Zelda are wonderful. Listening to the game with normal speakers gave the same satisfaction as past Zelda's, but when I slid my headphones on; I was surprised at how much better the experience was. All the sound effects were very crisp, from the collection of a rupee to the background music. One of the best uses of sound effects in the game was during the boss fight with Koloktos. (Notice how using the boss name removes any change of spoilers, hah ha!) Picking up the huge sword and swinging it from left to right has the audio 'whoosh' by my head. I did this far more times than were needed to defeat the boss for the satisfaction, I'll admit. What can a player expect from this Zelda game as a whole? Well, they should grow used to very loose dungeon definition, with easy bosses. They shouldn't be too upset that the game throws them a bone with hints very often. However, they should be concerned about the backtracking and filler of the game. That is not acceptable. Nintendo is a master of level design though, and their clever gameplay will have them keep playing despite it. 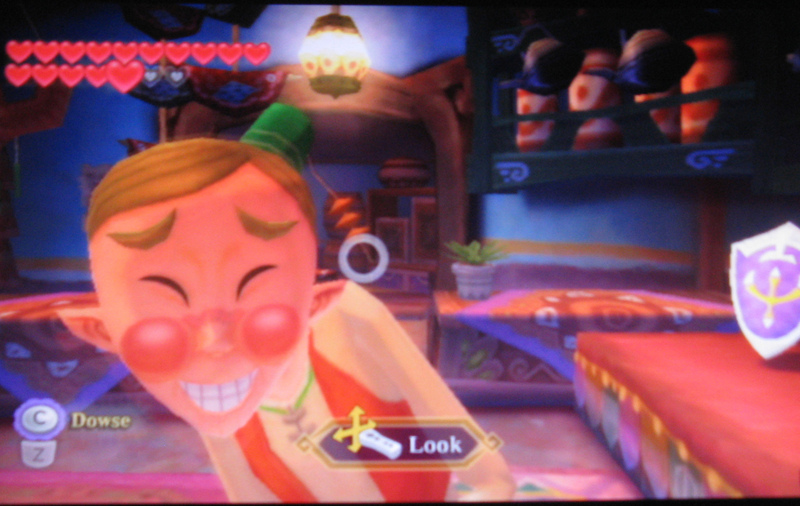 The tinkle of rupees will have them smile, and the music will be pretty good. The graphics will fit the part, and the characters filling the landscape are ok as quest givers but not much more. When it is all over, players will find that they enjoyed controlling Link as they never have before, with their own motions dictating the blade, but are not sure if they would play the game much longer. Finally, they will play 7-hour sessions, whether it be because of addiction, or because they hate the collectables, that is for them to decide. I apologize for the low-quality photos in this article. I didn't have the screen-capture card available but wanted original screenshots that aren't just taken from the press kit.